The metal bench facing Twyncarn Road is a memorial to the 12 people who died in this vicinity in 1875 because a dam burst. See the footnotes for their details. The drawing on the left was published in the Illustrated London News at the time. The dam was built in 1792 to create a reservoir which supplied water to the Crumlin arm of the Monmouthshire Canal. If you’ve just scanned the QR codes for the memorial, you can see a remaining section of the canal – an aqueduct – to the left. The footpath follows the old towpath. By 1875 a flannel factory occupied land west of the aqueduct. The owner, John Hunt, lived on the premises with his family. Some apprentice workers also slept at the site. On the night of 14 July 1875, torrential rain fell on South Wales. 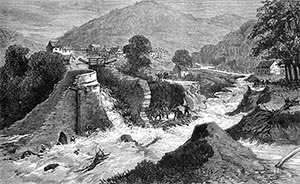 When the poorly maintained dam broke, a torrent raced south-westwards towards the canal. William Bowen, in the first cottage hit by the flood, managed to swim to safety with his young child, then with his wife. His neighbour, miner Uriah Govert, knocked a hole in his house wall to get his wife, four children and himself out of harm’s way. Another cottage was crushed, killing the occupants – Howell Davies and his son and daughter. After sweeping away a road and part of the canal, the flood reached the flannel factory. It was still powerful enough to demolish buildings and carry away nine of the 10 occupants. The tenth, apprentice James Foley, clung to machinery until the flow had abated. Mr Hunt was deposited downstream but was too badly injured to call for help. According to press reports, his dog had kept close to him and its barking summoned helpers. The factory owner died of his injuries four days later. After his death, a large rusty nail was found embedded in one of his hips. The inquest was held at the Cross Keys Inn, Cross Keys. The Hunts were buried at the Independent Chapel in Pontygwaith, other victims at Trinity Chapel, Cross Keys. Two of the bodies were carried over the ridge for burial in Bedwas, in the Rhymney Valley. Although the disaster was caused by neglect of a dam, it was not until a dam disaster had killed 16 people in North Wales – 50 years after the Cwmcarn event – that Parliament introduced safety regulations for dam building and maintenance. Two other fatal accidents occurred in the Cwmcarn area within three years – an explosion in the shaft of Cwmcarn colliery and the Prince of Wales Colliery disaster which killed 268. John Hunt, aged 49. Owner of the flannel factory. Mary Ann Hunt, aged 52. Wife of John Hunt. John Hunt, aged 22. Son of Mr and Mrs John Hunt. Letitia Hunt, aged 21, daughter of Mr and Mrs John Hunt. Elizabeth Hunt, aged 19. Daughter of Mr and Mrs John Hunt. James Hunt, aged 10. Son of Mr and Mrs John Hunt. Mary Jones, aged 15, factory hand. George Klein, aged 15, factory hand. Elizabeth Weeks, aged 17, factory employee. Howell Davies, aged 60. Resident of a cottage nearby. Margaret Davies, aged 38. Daughter of Howell Davies. John Davies, aged 34, collier. Son of Howell Davies.